helped us reach our goal of 500 Bulls. Once you make your gift, we encourage you to share this link with other USF alumni and friends to celebrate the journey to preeminence and help launch USF into a new era. We are thrilled that you have taken the opportunity to make an immediate impact on the success of our students and the USF community. 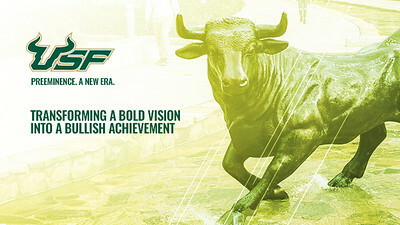 From all of us at USF, including Rocky D. Bull, THANK YOU for supporting USF's New Era Fund and joining the celebration. Here are some sample tweets and Facebook updates you can post on your social networks! Your gift of $5 provides students with the chance to succeed. Your gift of $15 maximizes student success at USF. Your gift of $25 provides students with opportunities to fearlessly dive into all that USF has to offer. Be bold and impact the lives of our students, faculty and staff with a gift of $50. Show your Bullish pride with a gift of $100. Merritt Martin serves as the director of Public Affairs at Moffitt Cancer Center. Her responsibilities include advocating for Moffitt and cancer patients before the Legislature and Cabinet while also increasing Moffitt’s awareness in the community and state. Prior to her role at Moffitt, Ms. Martin worked for the Florida House of Representatives as a legislative aide for State Representative Bill Heller. She also managed his successful re-election campaign in 2008. During the 2006 elections, Ms. Martin served as the finance director for a constitutional amendment campaign which ensured funding for youth tobacco prevention. She also spent several years as the advocacy director for the American Cancer Society. George Papadeas is a 2013 graduate of the University of South Florida Muma College of Business, proud USF Alumni Association Life Member and serves on the BOLD (Bulls of the Last Decade) Philanthropy and Engagement Council. During his time at USF he served as Student Government vice president, was named the Outstanding Graduate of his graduating class and is a member of the Delta Chi fraternity. Currently George is the chief operating officer of The HOTH, a search engine optimization service, in St. Petersburg, Fla.
Hannah Veitkus is a 2016 graduate of the University of South Florida Sarasota-Manatee, proud USF Alumni Association Life Member, Women in Leadership & Philanthropy member and serves on the BOLD (Bulls of the Last Decade) Philanthropy and Engagement Council. Currently Hannah works as a realtor with Wagner Realty in Sarasota, Fla. During her time at USFSM she served as president of the Student Ambassador program for two years, was actively involved with the local alumni chapter and was a USF Women in Leadership & Philanthropy scholar. Thank you for joining the celebration of USF's journey to preeminence! This is a huge accomplishment and testament to our university. Thanks to alumni and donors like you, our students, faculty and staff can succeed and grow at the University of South Florida, along with providing abundant opportunities for future Bulls. Please make a gift of any size, and spread the word.